Based in the quiet area of Ravelston, this spacious property offers the perfect respite from the hustle and bustle of the city, yet is just a 25 minute walk, or short drive away from the activity of the city centre. Conveniently located on the ground floor with it's own private access, this 1930s lower villa comes finished to a very high standard. A rather generous driveway parks up to two vehicles, and a welcoming front garden separates the property from the street. The sunny patio to the rear of the villa creates the perfect hideaway for you to enjoy the fresh suburban air away from the city. Three bedrooms allow a comfortable night's sleep for six guests, with one kingsize master bedroom, one double bedroom, and a further bedroom with twin beds. A traditional family bathrooms gives you the option of both a bath, and a separate shower cubicle, complete with WC and basin. The property also benefits from an additional, separate, WC and basin wash room. Neutrally decorated, the cosy living room comes fully equipped for you to kick back and relax, hosting a three piece suite, cable TV, DVD player, and WiFi. The fully fitted kitchen is equipped with all the mod cons, including electric oven and grill, ceramic hob, fridge, washing machine, dishwasher, microwave and all utensils and crockery. A delightful dining conservatory completes this home from home. When you're ready to explore the beautiful and historic centre of the city, a regular bus service will get you there in ten minutes. Or, if you prefer door to door service, a taxi will only set you back £6.00. Sleeping arrangements Two double bedrooms and one twin room. Exterior This lower villa was built in the 1930's and has its own front and rear doors, private driveway, front garden and delightful sunny rear patio area. Parking notes This property benefits from a private off-road parking space for two vehicles, and free on-street parking for any additional vehicles. Private monoblock driveway that can accommodate two vehicles. There is an additional wc so that anyone showering or bathing does not preclude the use of toilet facilities. Interior layout The accommodation is of a high standard with a fully equipped kitchen, conservatory dining room, sitting room with cable TV, DVD player and Wi-fi; 3 double bedrooms (sleeping a maximum of 6 persons); bathroom with bath, separate shower cubicle, WC and wash-hand basin; wash-room with WC and wash-hand basin. Local area Your accommodation is located in the Ravelston area of Edinburgh in a quiet residential neighbourhood, away from the hustle and bustle of the city centre but only 25 minutes walking distance or a short bus or taxi ride from Edinburgh's Princes Street. Mike and his son Rhys were very kind and accommodating with our requests. My family loved the place as it was cosy, clean and homely. The facilities were great and the beds comfortable. My Mum says she would definitely like to stay here again. The price was so reasonable for the number of rooms and the type of property. 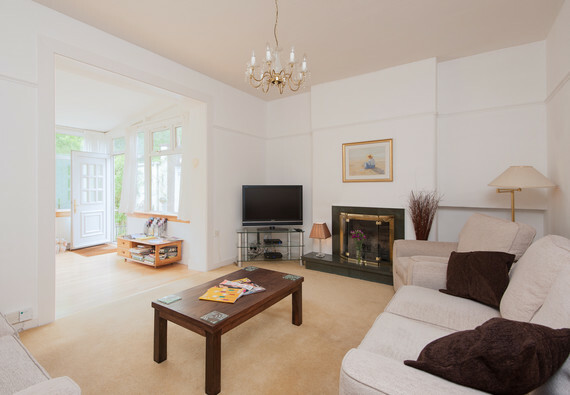 Excellent appartment, everything we needed, lovely quiet area, good bus route to city centre.